We’d love your help. 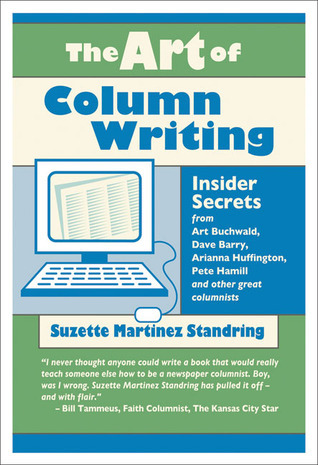 Let us know what’s wrong with this preview of The Art of Column Writing by Suzette Martinez Standring. To ask other readers questions about The Art of Column Writing, please sign up. As a columnist I found the book to be a great reminder of exactly what it is I'm doing. The shared stories and lists would be very helpful to bloggers too, I'm sure. This is a great book for bloggers as well as those looking for newspaper syndication. A pleasant surprise for me as a chapter written by Leonard Pitts, whose columns I assigned when I was a writing teacher. Here he writes about getting beyond the knee jerk reactions to underlying cause and effect. Other columnists discuss their beats. That could be religion, senior citizens, education, parenting, pets or music. The advice in this book is great weather coming from a top columnist like Pitts or This is a great book for bloggers as well as those looking for newspaper syndication. The advice in this book is great weather coming from a top columnist like Pitts or a working journalist like the author. Reading this book was like being back in school taking journalism classes. I enjoyed reading this book more than I expected. Lots of interesting anecdotes from columnists. Very useful and made me realize I want to be a columnist! My review of this book appeared in the November 2008 issue of The Writer magazine. Some really good information, but a little dated and sometimes a little too cutesy. Good read, though. For my editorial writing class.